No cost was spared in preparing this home for those wishing for a true island getaway. All bedrooms are decorated in elegant island style and each have access to a full bathroom. There is complimentary wireless DSL and a separate home office space off the living room which also boasts a large family game table to allow the kids (of all ages) to have room to play. Make Aloha Lani your own personal getaway year after year. Walking distance to the Princeville Shopping center, Library and children’s park. Easy access to both Makai golf course and Princeville Spa. Only a short drive to Anini, Kalihiwai, Hanalei Bay and all of the most beautiful Kauai north shore beaches. POIPU, KAUAI VACATION RENTAL: At this newly built (2009), 5 bedroom 4 ½ bathroom luxury home, every amenity you need for relaxing vacation on Kauai is provided: sunny location, outdoor pool with patio, 5 airy and large bedrooms with ceiling fans and Air Conditioning, marble tiled bathrooms, fully stocked kitchen with Wolf appliances, and a large, high ceiling living room with sliding walls that lead to the outside, where you can bask by the pool or enjoy an afternoon BBQ. Alohilani is equipped with wireless high speed internet access. For security purposes, Alohilani is equipped with a safe and an alarm system. The Pool is 36′ X 16.5 ‘ and 6 feet deep. There is a Gas BBQ, Wolf Range, fully equipped kitchen, and a Game room with a chess/backgammon table. Ceiling fans throughout. Accommodates 10 guests. ALIOMANU BAY, KAUAI VACATION RENTAL: Once you settle into the serenity of Anahola Hale, you may lose track of time soaking in the unique Hawaiian experience of Anahola village. This fully equipped beach-front, single-level 3 bedroom, 3 bath home is everything you need for your perfect Kaua’i get-away. Sweeping panoramic ocean views are enjoyed from the living room, dining and kitchen. The master bedroom is furnished with a King size bed, sitting area, private lanai, large en-suite bath with private toilet, large walk-in glass tiled shower, an additional private lava rock outdoor shower and double vanity. The guest room with two full beds uses the hall bath/shower while the third bedroom with queen size bed has an en-suite bathroom with tile shower. All bedrooms offer ceiling fans. The kitchen is fully stocked with all of the amenities to make you feel at home including Sub-Zero refrigerator, Wolf gas stove/oven, double dish washer and gas lined BBQ off the lanai. If you don’t feel like hanging on the beach, there’s a lanai for dining or lounging that captures full ocean views. 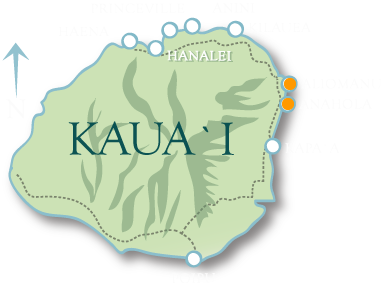 Anahola village is located just 10 minutes to Kapa’a and Kilauea, 15 minutes to Princeville and 25 minutes to Hanalei. Surrounded by the stunning mountains of Kauai’s Coconut Coast, the village has an authentic quiet charm that is reminiscent of days past. Anahola Beach, one of Kauai’s few sandy bottom beaches is perfect for swimming, surfing, kayaking, body boarding, SUP, shell-picking and sun bathing. If you feel like testing out the Hawaiian art of throw net, it’s also perfect for fishing. Nearby amenities include smoothie/juice bar, Post Office. small town market, Ono grill for burgers, sandwiches and milkshakes. Sleeps 6. 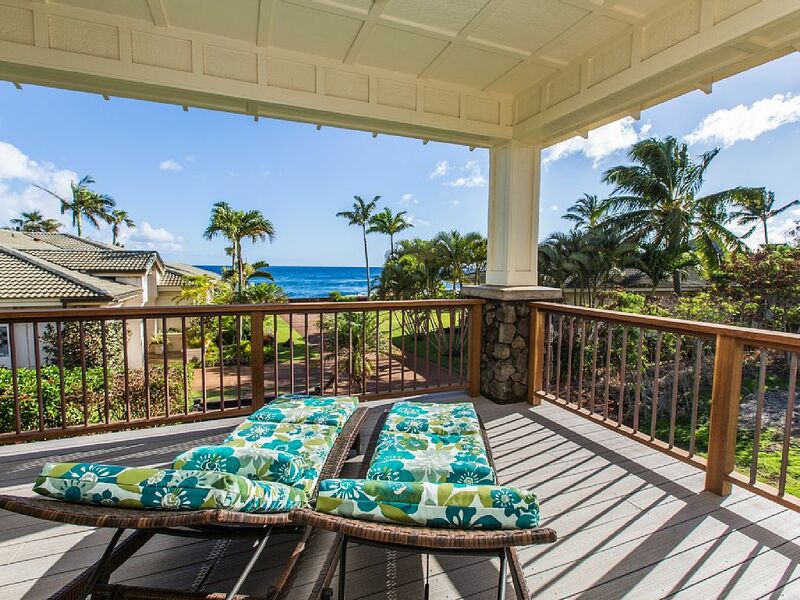 ANAHOLA, KAUAI VACATION RENTAL: Enjoy the lavish Hawaiian sun on the spacious outdoor deck perfect for entertaining at this newly renovated 4B/4B exquisite oceanfront home. Here you will be able to prepare your succulent grilled steaks and that fresh caught fish while enjoying a nice cold cocktail in the evenings- or enjoy a nice cup of coffee with some fresh island fruits while watching the sunrise in the mornings. The upstairs of the home offers a very spacious gourmet kitchen where the whole ohana (family) can prepare a nice meal to enjoy while conversing in the open area. The kitchen opens to the dining room and living area. All bedrooms are located on the lower floor of this home. Three of the bedrooms have an en-suite bathroom. The fourth bedroom is ideal for children, as it has 2 twin beds and a full/twin bunk bed. There is a bathroom adjacent to this bedroom which is shared with a cozy sitting area for a few children to enjoy. The Anahola Sun is a 4B/4B home that will accommodate up to 12 guests- so bring the whole family! ANINI BEACH, KAUAI VACATION RENTAL: Spoil yourself in this exquisite oceanfront estate with your own private beach at Anini on the north shore of Kauai. Savor the views and enjoy the gentle trade winds from this beautiful home with exceptional quality throughout. Immaculate and remodeled 4 bedroom main house and 1 bedroom guest house with lush grounds and private beach at Anini. Come explore this famous north shore two-mile stretch of soft white sand and the largest living coral reef on Kauai. Snorkel in the tropical water and observe sea turtles, paddleboard for a different perspective, enjoy yoga on the beach, swim, kayak, and enjoy a cocktail on your beach as you watch the sunset. You will relax and time will melt away as you enjoy this private tropical estate. The Anini House offers a 4-bedroom 3.5 bath main house plus a private 1 bedroom 1 bath guest house. The grounds offer different destinations for meditation, relaxation, outdoor yoga or just a peaceful nap in a hammock. The property is a popular site for weddings and receptions as well with a chef’s kitchen and room to spread out. – 2 Master suites with King Beds and private bathrooms. – 1 Kids bunk room with three twin beds and private bathroom. – A fully equipped gourmet kitchen with jade green granite counters, custom cabinetry, Sub Zero refrigerator, and six-burner range and oven. – Large meticulously manicured grounds with barbecue area and lush tropical flowering plants. 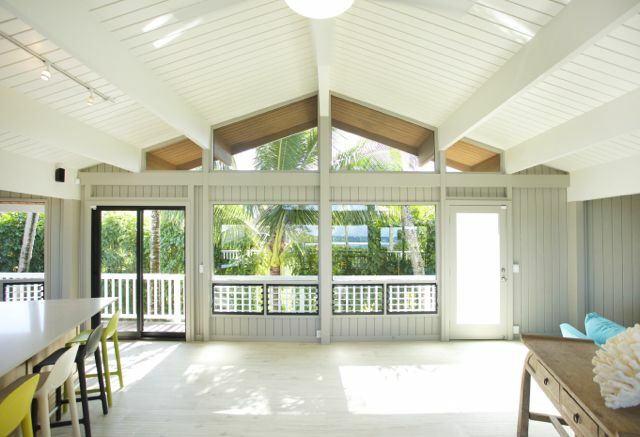 – Seamless indoor/outdoor living with two covered Ipe hardwood ocean view lanais. – Fully separate one bedroom guest house with King bed and comfortable lounging area. The Anini Beach House is on the sand at Anini Beach, one of our famous north shore gems and one of Kauai’s finest seasonal snorkel locations. 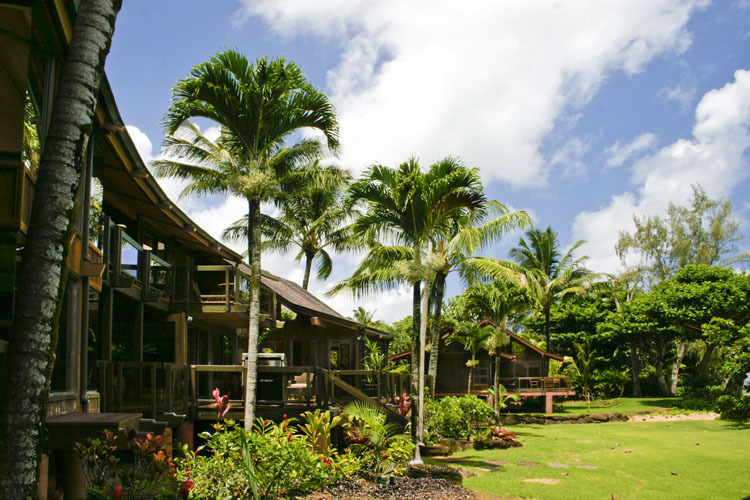 Five minutes from Kilauea town, you will find wonderful restaurants and charming boutiques. Historic Hanalei Town is a 10 minute drive from the house where you will find more fine restaurants and boutiques as well as services including massage and yoga, and shops to rent snorkel gear, bikes, or kayaks. ANINI BLUFF, KAUAI VACATION RENTAL: The gated Anini Vista Estate is an immaculate 5 bedroom+, 5 and a half bath vacation home. The Estate features fabulous coastline views from almost all rooms of this 7000 Sq.Ft. home. For those looking for the best of the bests, this is it! 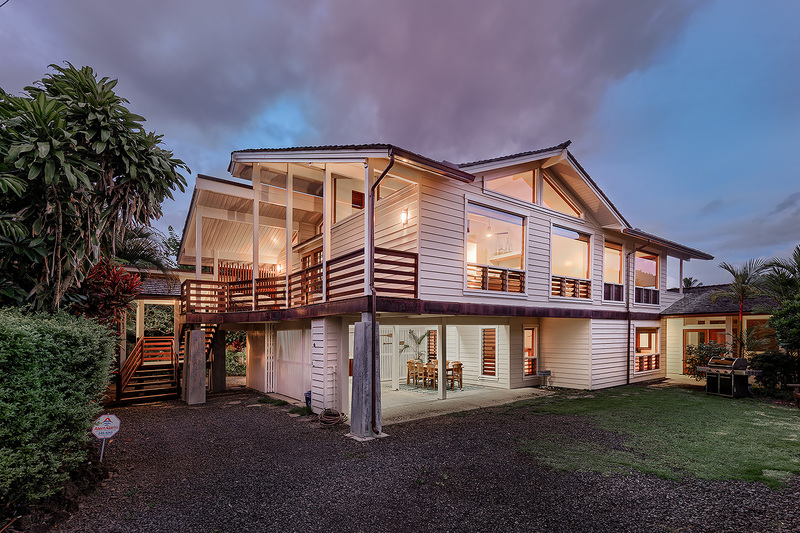 A home that can be shared with loved ones and friends or for those looking to just get away from everything and surround themselves in the architectural beauty that the Anini Vista Esate holds. The estate is centered on a magnificent lagoon-style saltwater pool, with two waterfalls, a grotto, hot tub and bridge. Inviting ocean views and expansive gardens surround the main and. guest house, which are connected by a covered outdoor breezeway. 2 under counter sub zero frig. 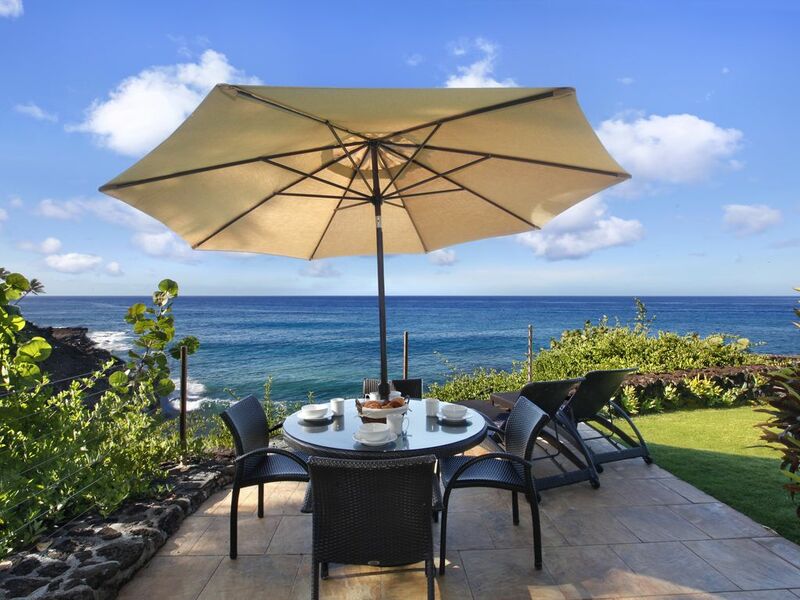 HAENA, KAUAI VACATION RENTAL: Savor the ocean views and enjoy the gentle trade winds from the beautiful vacation home with exceptional quality throughout. The Haena Hula is just steps from the Haena Beach in front and a short walk to Tunnels Beach just down the way– one of our finest seasonal snorkel and surf locations on the North Shore. A few minutes drive distance to “the end of the road” at Ke’e beach and the start of the breathtaking Kalalau Trail and the famed Napali coast & 5 miles from Hanalei Town. 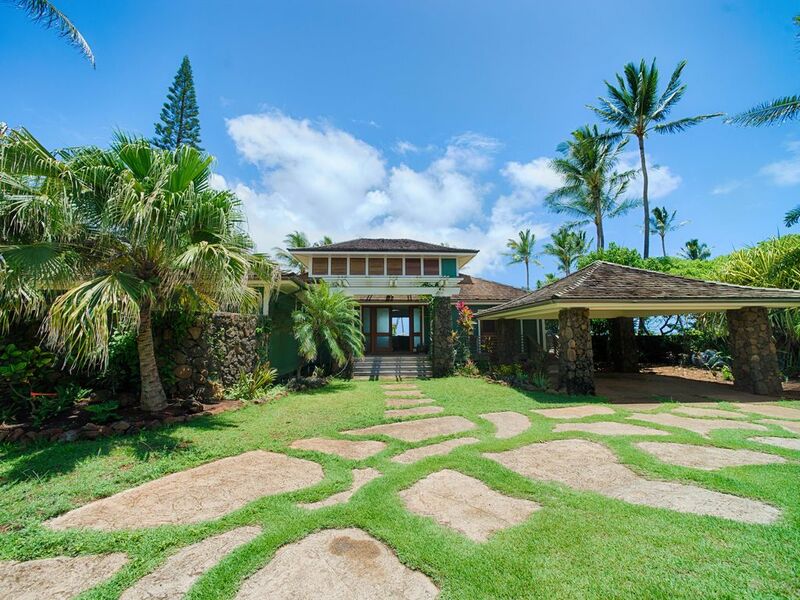 HAENA, KAUAI VACATION RENTAL: Kauai’s North Shore has been a frequent backdrop for countless movies due to its incredibly lush beauty and phenomenal beaches. Nestled within this gorgeous, pristine expanse, lies the 3B/ 2B Haena Kai. Set back just thirty paces from a soft, deserted, coral sand beach, this three-bedroom, two-bath, elevated home awaits your family retreat. If you want to escape the crowds and let the soothing surf wash your cares away, welcome to your piece of paradise. Surrounded for privacy by a lava rock wall, towering coconut palms, and lush landscaping, Ha’ena Kai’s elevated position, wall of windows, and wraparound lanai capture superlative views of the reef and fringing mountains. The home’s open architectural design creates an inviting gathering space while also allowing for breezy trade winds to cool the sanctuary naturally. Additional ceiling fans are strategically located throughout the structure to ensure your comfort yet retain that Old Hawaiian feel. Best of all, Haena Kai has recently undergone a dramatic and purposeful renovation to make your visit a respite of pure pleasure and renewal. The home’s interior has been tastefully yet charmingly transformed to meet your every need in style. A new gourmet grill on the lanai and a kitchen filled with state-of-the-art, stainless steel appliances beckon you to prepare that special meal you’ve always wanted to enjoy in a tropical setting. But if you don’t feel like cooking, no worries! One of Kauai’s top-rated restaurants is but a hundred-yard walk down the beach. The main living area has been appointed with invitingly comfortable furniture and should you desire some visual entertainment, the new 65-inch 4K UHD television set awaits. The main living area is also equipped with a workstation and high-speed wireless internet access for those who must touch bases with the outside world. When the day is done, three thoughtfully appointed, soothing bedrooms stand ready to comfort and recharge your soul and the 1000-count Egyptian cotton sheets ensure your slumbers will be sound and satisfying. AC in all bedrooms is a rarity and another reason Haena Kai is a true gem! 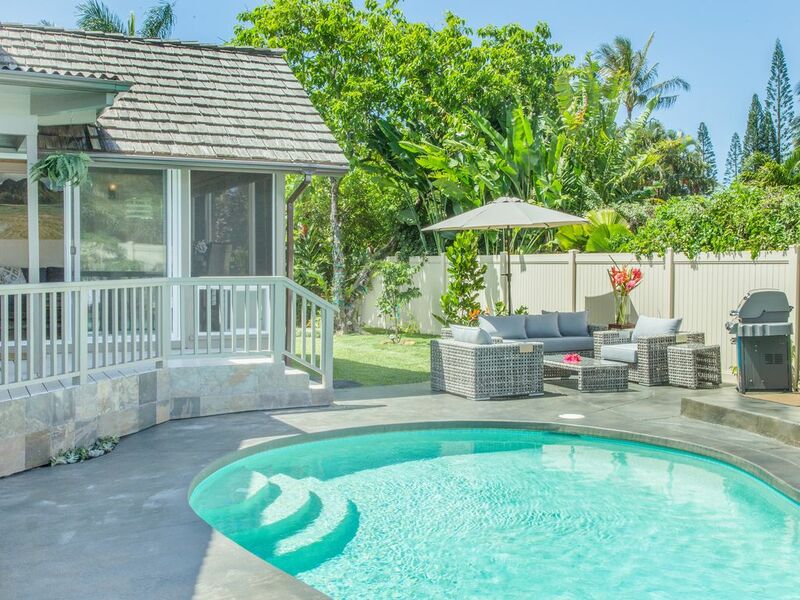 POIPU, KAUAI VACATION RENTAL: Whether you’re traveling with a large family or group of friends, Hale Hapuna (6B/6.5B) home is the perfect choice. It offers the ideal setting with approximately 5,000 square feet to spread out. Extra spacious living areas offer plenty of room to relax and enjoy each other’s company. Roomy, air conditioned bedroom suites offer the perfect end to a perfect island style day. The chef(s) in your group will greatly appreciate the well equipped kitchen. They may even want to venture out to one of our Farmer’s Markets for some fresh local produce to include in one of their tropical culinary creations. Enjoy the tropical breezes and fragrant scents from the multiple seating and dining areas on the expansive, wrap around lanai that offers panoramic ocean, mountain and coastline views. Feel like you are on top of the world as this home is located at the highest point in Poipu on the top rim of an extinct crater that overlooks the Poipu Resort area. 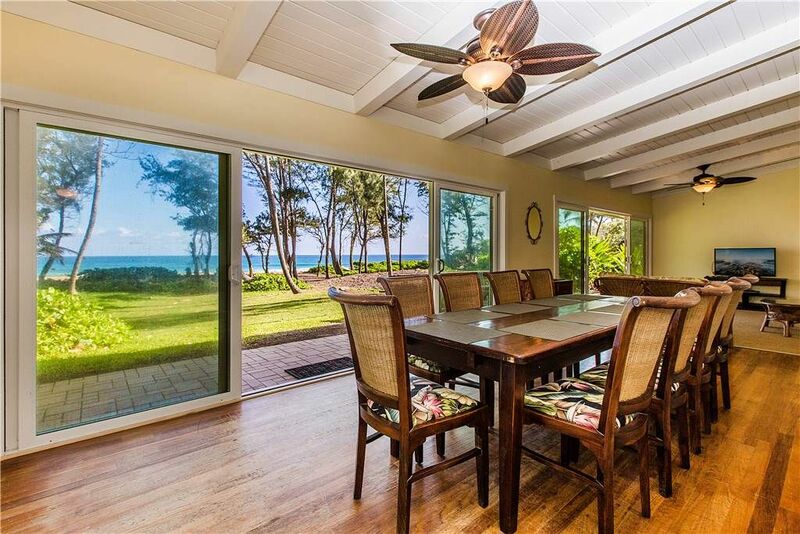 Although it may be difficult to leave this lovely home for more than hour, you are within walking distance to 3 of Kauai’s finest beaches: Shipwreck Beach to the East (best for experienced swimmers and surfers), Brenneckes Beach and Poipu Beach Park to the West. Hale Hapuna also offers and additional unattached, fully equipped 1,000 square foot guest cottage (Ohana Unit as we say on Kauai), offering accommodations for an additional 4 guests. Located directly behind Hale Hapuna, this cottage may be rented along with the Hale Hapuna main home. 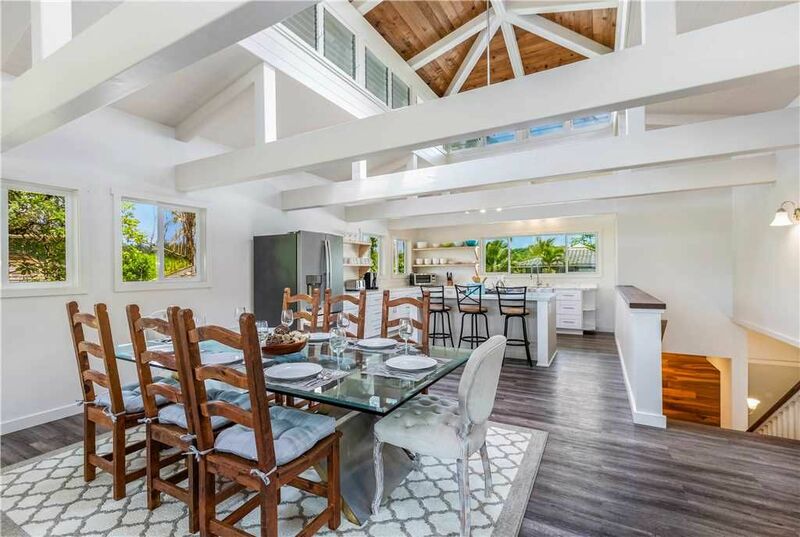 PRINCVILLE, KAUAI VACATION RENTAL: Hale Kaila Hou is a beautiful, recently renovated 4b/3b modern style home on the Princeville Golf Course. This home offers an open floor plan on the first level, which includes a large modern kitchen with all new modern appliances and an open dining room area. It also features an open living area, with great views of the lush mountains of Namolokama, along with a guest bedroom and bath. High ceilings throughout this large open living home. 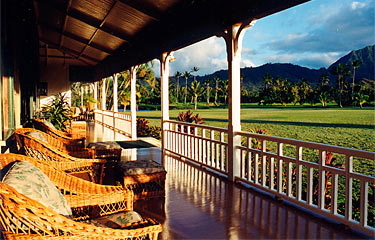 HANALEI, KAUAI VACATION RENTAL: When it comes to location and luxury, it doesn’t get better than Hale Makala. 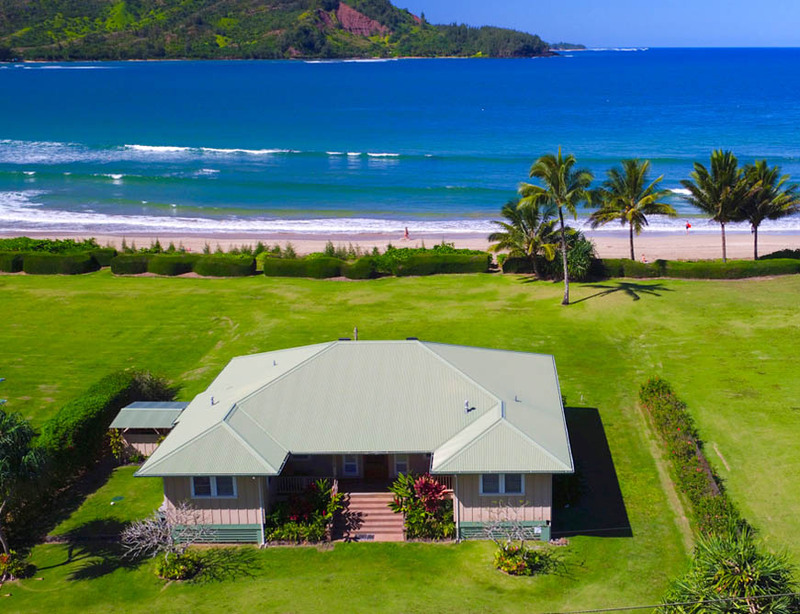 This incredible property is located right across from Hanalei Bay on coveted Weke Road –just stepping outside you’re only a few yards from the island’s most famous beach. Take advantage of your proximity by watching sunrises and sunsets, strolling along the soft sands before the crowds come to soak up the sun, or simply enjoy watching the sky slowly blend its pastel pinks into deeper blues from the prominent windows of your condo, which gives access to incredible views of the shoreline and distant mountains. This home features 3 bedrooms (King, King, and 2 doubles), 2 ½ baths (shower, tub/shower). Beautiful hardwood floors in living, dining and newly renovated kitchen areas; carpeting for comfort in all three bedrooms. The master bedroom is outfitted with a king-sized Tempur-Pedic mattress, soft neutral carpet, and a desk perfect for recording your adventures. A second king-sized bed in a private room and a third bedroom with two double beds make Makana Hanalei an ideal vacation spot for families, couples, or groups of friends. There’s really no better way to spend your time exploring the hidden wonders of the Garden Island than in the complete luxury and relaxation of Hale Makala. Some might consider the natural wonders luxury in and of themselves, but Hale Makala has a few added benefits that will make you feel like nothing short of royalty. The entire second floor is lined with a wooden lanai or patio replete with white wooden lounge chairs shaded by the overhanging roof and an outside dining area to take full advantage of the natural setting. Inside, you’ll be welcomed by modern wooden floors and high vaulted ceilings in the vast combined dining and living room. The actual kitchen is separate but connected to the lanai dining space with sliding French doors. The newly renovated modern kitchen has all the latest appliances, bright white cabinets, and an island. A well-stocked kitchen features a large wooden central cooking island for plenty of counter space and ease of preparing delicious island-style dishes (make sure to take advantage of the twice-weekly Hanalei farmer’s markets and natural food store in the Hanalei village!) Eat indoors in the formal dining area or step out onto the wonderful covered lanai – sliding french doors open right off the kitchen to the teak dining set provided. Sleeps 8. PRINCEVILLE, KAUAI VACATION RENTAL: Hale Nalani, a beautiful 3 bedroom/ 2.5 bath home located in a quiet neighborhood in Princeville. 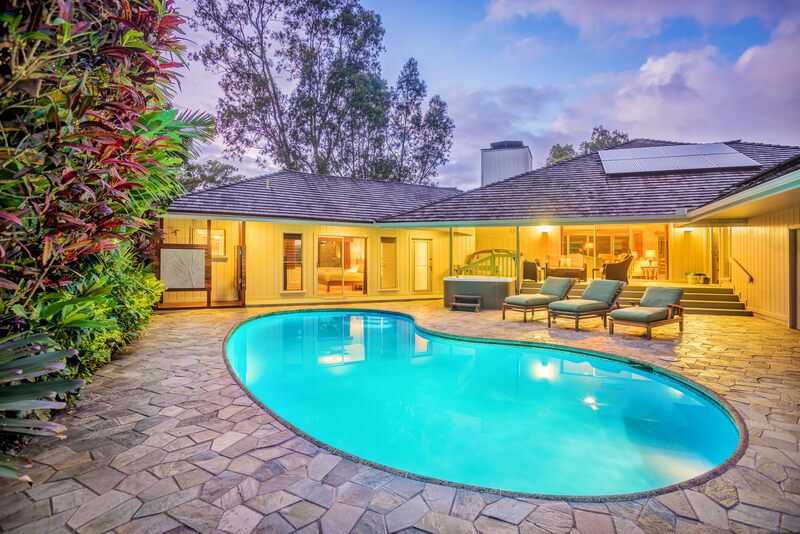 Centered upon a private and peaceful walled courtyard with a 40 foot pool, this home offers 2600 sq feet of air conditioned* high quality living. Custom built-ins, hardwood floors throughout, a fully stocked chef’s kitchen that is fully stocked with commercial grade appliances and a huge granite counter, are just a few of the living area features. Outside and inside blend seamlessly through double fully opening walls, allowing the flow of breezes throughout the home and connecting all living areas with the shaded poolside outdoor seating and dining areas. The generous master suite has a King size bed, pool views and ensuite bathroom. The second King suite sits beside the garden and also has an ensuite bathroom. The third bedroom has a Queen size bed and is adjacent to the half bath. Come enjoy Hale Nalani! Sleeps 6. 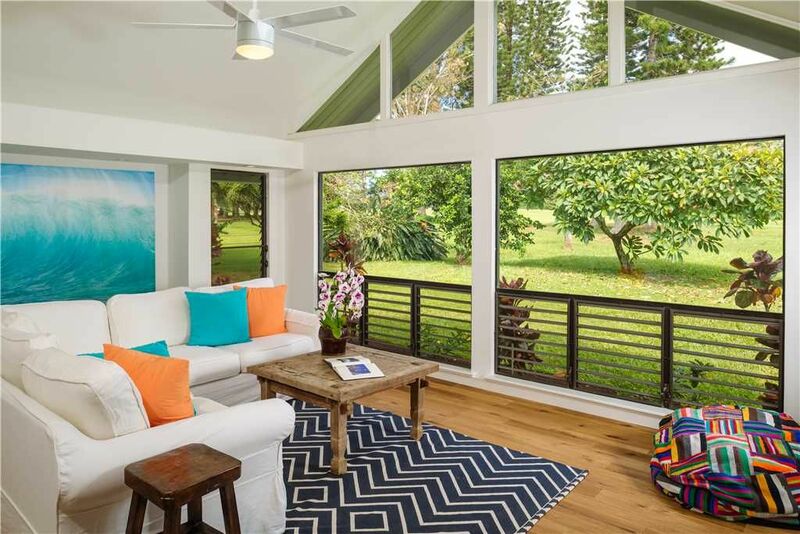 KILAUEA, KAUAI VACATION RENTAL: Designed by renowned Architect Gary Tobey of Design Concepts, this newly built single level home is on Kauai’s beautiful North Shore. The 3 bedroom, 2.5 bath, 3,800 sq. ft. home offers panoramic ocean and mountain views with extensive windows throughout. A relaxed ambiance is assured with exterior lanai’s, swimming pool, and water feature/fountain entry. This home has recently been appointed with designer furnishings and a 60 inch flat screen TV in the media rm. The chef’s kitchen with Stainless Appliances, Gas cook top and large prep island is a gathering place for family and friends. The master suite features a king size bed, an additional sitting area & 42 inch flat screen TV. The master bath includes his and her sinks, a large tub with view & fabulous private outdoor shower. Two other suites include a king size bed in one two full size beds in the other. In all, the home accommodates up to 8 guests. Close to beautiful beaches, golf courses, shopping and activities. Sleeps 6. 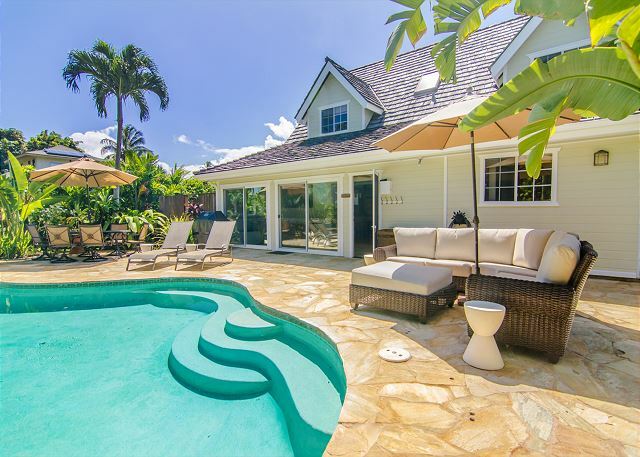 PRINCEVILLE, KAUAI VACATION RENTAL: Located in Princeville, a prime neighborhood in the heart of Kauai’s North Shore, Hale Ontario (3B/3B) is new to the market after a complete renovation. 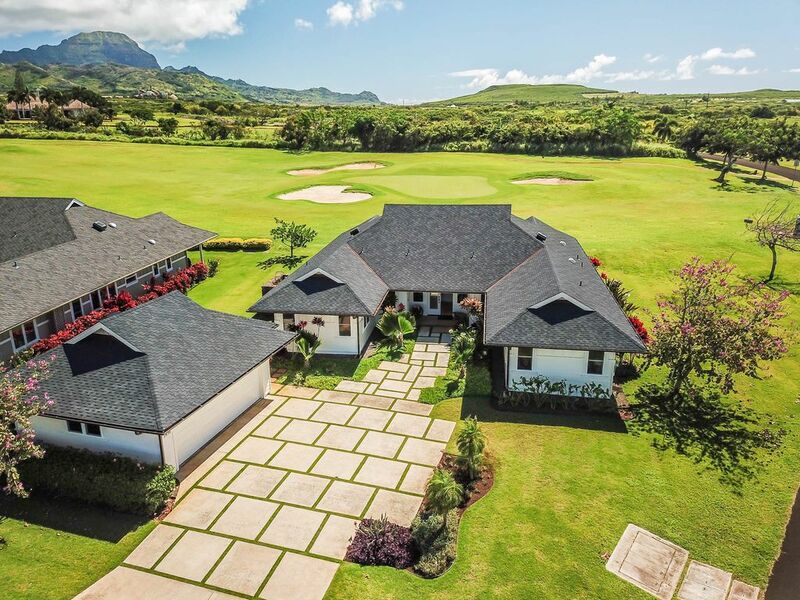 The home is located on the 6th hole of the Makai Golf course and enjoys stunning views of the Pacific Ocean and the Bali Hai mountains, from almost every window. Hale On’tariō is a relaxed, stylish choice for couples, families or friends who want to enjoy Kauai’s many charms and adventures. This comfortable home boasts a great room with floor to ceiling windows and classic beach furnishings. Groups can gather here and enjoy a 60” flat screen HDTV with cable, Apple TV, Blu-rays and DVDs. There is a well-equipped galley kitchen designed to make assembling fresh meals easy. The dining table seats eight and a large gas barbecue is available. Nature is never far away at Hale Ontario. The lanai has two lounge chairs positioned to star gaze, catch the sunset or enjoy the beautiful indigo moods of the ocean with a cup of morning coffee. There is even a Laysan albatross nesting in the yard. There is a screened-in porch off the great room with a dining area for alfresco meals. There are two master bedrooms on the main floor and a loft bedroom – each with a private bathroom. The loft has another flat screen TV. Air conditioning is available (extra charge) and there are many powerful ceiling fans to keep things cool. 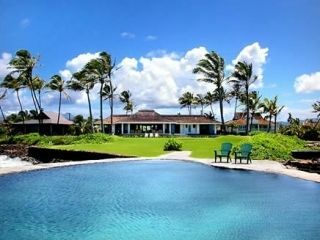 POIPU, KAUAI VACATION RENTAL: The Hale Pohaku Kai is a meticulasly decorated and styled 3B/3B plantation style home. Leave your slippahs outside the door so they are ready to make the 50 steps to the water. You will enjoy white water ocean views from this beautiful, newly constructed home. Relax to soothing aqua tones of sea, sand and tropical skies, the interior features finest furnishings and fabrics, matched with natural volcanic rock and limestones from the Pacific Rim. Large master bedroom and huge bath on the second floor has its own private lanai and expansive views of the ocean and mountains. Downstairs are two more bedrooms, each with full bath, opening into a spacious open-floorplan living-dining area with a fully equipped kitchen with everything the chef requires. The high ceiling living room opens up onto a large, furnished wrap-around lanai with ample room for dining or just sitting out gazing at the ocean with a glass of wine or a cup of coffee. Walk north 5 minutes to Kukui’ula Shopping center to find shops, restaurants and a fabulous Farmer’s Market every Wednesday. Walk south 4 minutes to the Sheraton and Rumfire Restaurant and one of Kauai’s gorgeous turquoise beaches. 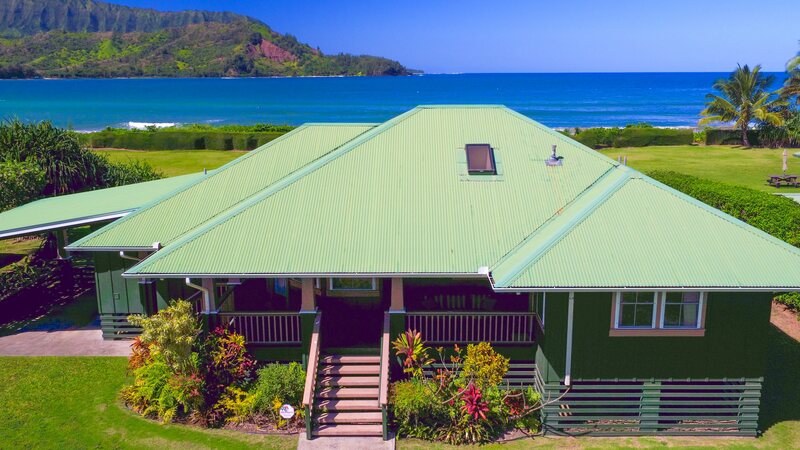 HANALEI, KAUAI VACATION RENTAL: The Hanalei Bay View is located on Kauai’s beautiful north shore, this 3B/4B oceanfront home is surrounded by lush, tropical foliage. Enjoy a spacious living room upstairs as well as a comfortable family room downstairs. The upstairs balcony features magnificent views of Hanalei Bay which is just a few steps from your door and is consistently rated among the nation’s top beaches. Located on Kauai’s beautiful north shore, this oceanfront home is surrounded by lush, tropical foliage. Enjoy a spacious living room upstairs as well as a comfortable family room downstairs. 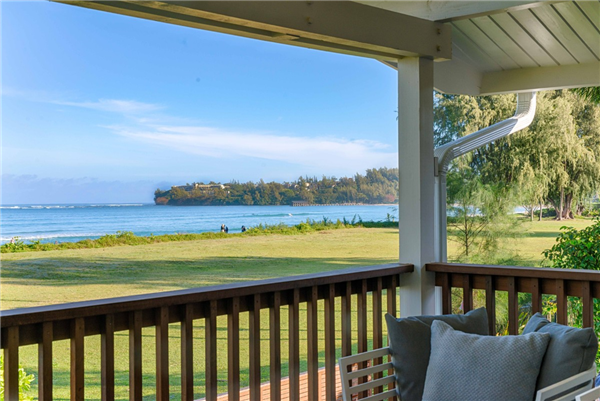 The upstairs balcony features magnificent views of Hanalei Bay which is just a few steps from your door and is consistently rated among the nation’s top beaches. Enjoy leisurely strolls along the water’s edge, a picnic lunch at the beach or simply bask in the sun in this special place and watch the waves roll in. 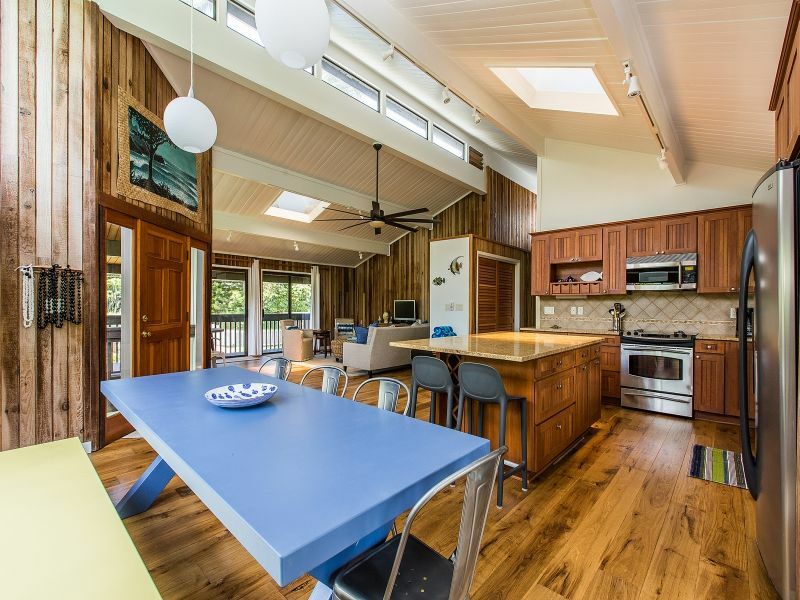 HANALEI, KAUAI VACATION RENTAL: Just across the street from the sand, Hale Hoku is a 5 bedroom/4 bathroom beach cottage with a sunny and open floor plan. Built up on post and pier, it is as if you are residing in your own private and breezy treehouse! Three master bedrooms with king beds and ensuite baths. The fourth bedroom with king bed and fifth bedroom with two twins will share a guest bathroom. The large grassy back yard sets the perfect stage for taking in the brilliant Kauai nighttime sky or a ripe opportunity to test your green thumb on the various fruit trees. Being just steps from the beach and town, the home’s location couldn’t be more ideal. Hanalei is a 2-mile long half-moon bay with white sand and majestic mountains – more than just beautiful, Hanalei is also an amazing ocean playground. Loved by visitors and residents alike, there is no place like Hanalei. While Hanalei is small enough to get around by foot or bike, a car is recommended if wanting to travel outside of the area. HAENA, KAUAI VACATION RENTAL: The gated estate of Holo Makani is located in the sand on a dramatically beautiful and pristine beach on Kauai’s North Shore coast line. Enjoy the lull of the ocean and the gentle trade winds coming in off the water while you enjoy your seamless indoor/outdoor living experience. This custom built, plantation style beach house, has quality appointments throughout which make it an excellent home to experience your ultimate vacation. With vaulted ceilings, wood floors, and bright whitewashed interior Holo Makani’s beautiful and comfy furnishings create a casual elegance which is inviting and relaxing. Complimentary amenities for this north shore, beachfront property allow for the ultimate vacation experience. While enjoying the lanai, you can delight in nature’s abundance with the coastline view, sunsets, sunrises, moonrises, turtles, whales, and seals. Sit back and watch windsurfers, paddlers, kite surfers, Hawaiian style fisherman and more! PRINCEVILLE, KAUAI VACATION RENTAL: Enjoy a secluded retreat at the 4 bedroom/ 4.5 bath Honu Awa, meaning Turtle Cove in Hawaiian. 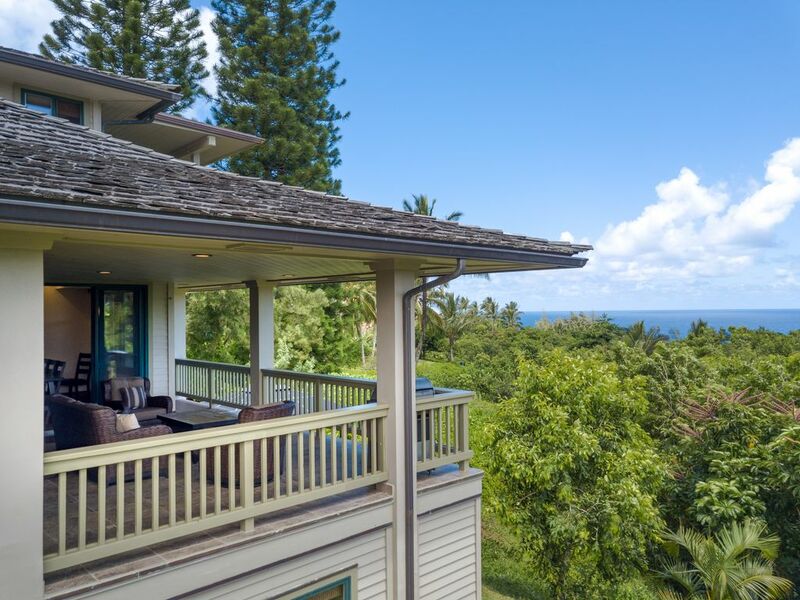 This upscale home sits on a dramatic bluff overlooking the north shore surf, a mesmerizing reef, and endless Pacific waters. 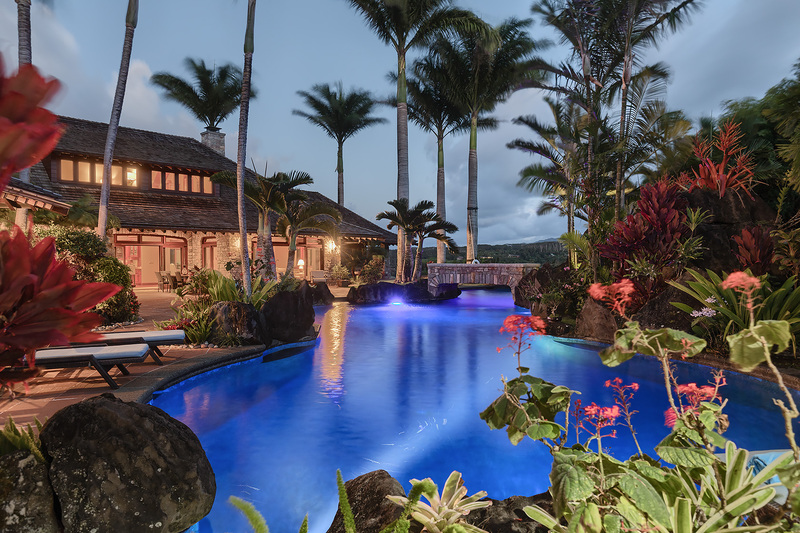 Located in the Princeville area of north Kauai, this exceptional villa provides convenient access to renowned Hanalei Bay and is just a short drive from other breathtaking beaches like Lumahai and Anini. The quaint bordering town of Hanalei also offers a variety of restaurant options, along with art galleries, boutiques, and surf shops. And whether you’re looking for snorkeling, hiking, boating, stand-up paddling, or golf opportunities, you’ll find them nearby on the north shore. Home features Split AC Systems in two bedrooms on the second level and one bedroom by the courtyard / pool area. Master Suite and Living Area features Central AC. Special Terms: Pool Heat is available for a fee of $75/ day. Please contact us for more information. POIPU BEACH VACATION RENTAL: You’ll never want to go home once you’ve experienced Ka Lae Kiki, the “Breathtaking Point”. 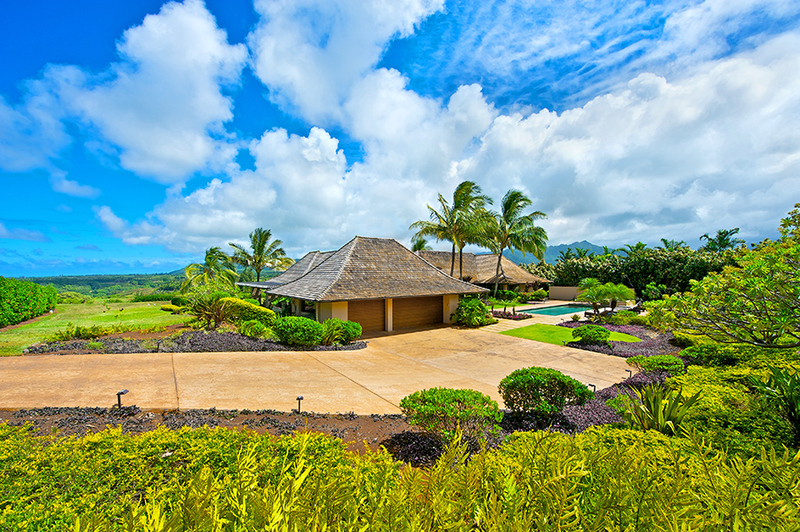 A one-of-a-kind private oceanfront estate located on Kauai’s sunny south side. Ka Lae Kiki is an idyllic getaway for those who prefer privacy, serenity and the rhythmic sounds of the waves. Constructed on an old family estate, this 4,000 sq.ft. 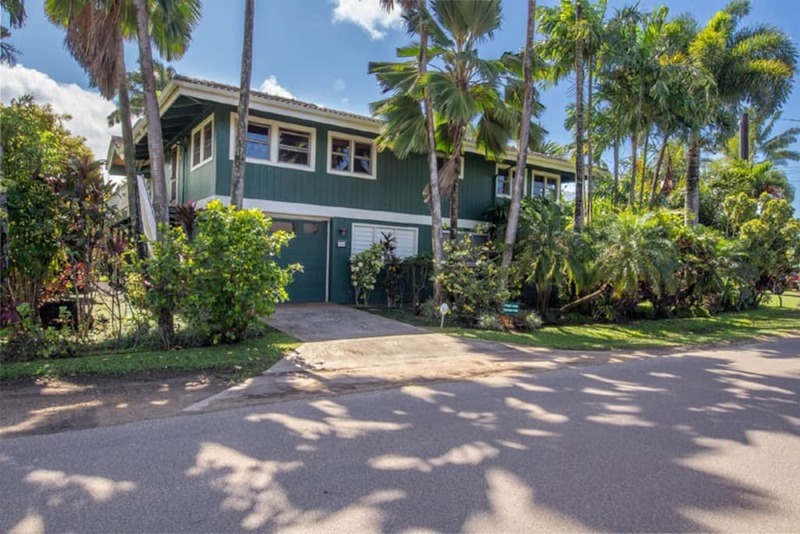 home features four tastefully decorated and comfortable bedrooms, all with glorious ocean views, a TV room/den with a pull-out bed, a modern kitchen and BBQ, 3 1/2 baths, an open air great room, a lanai sporting 180 degree coastline views of unobstructed sunrises and sunsets. 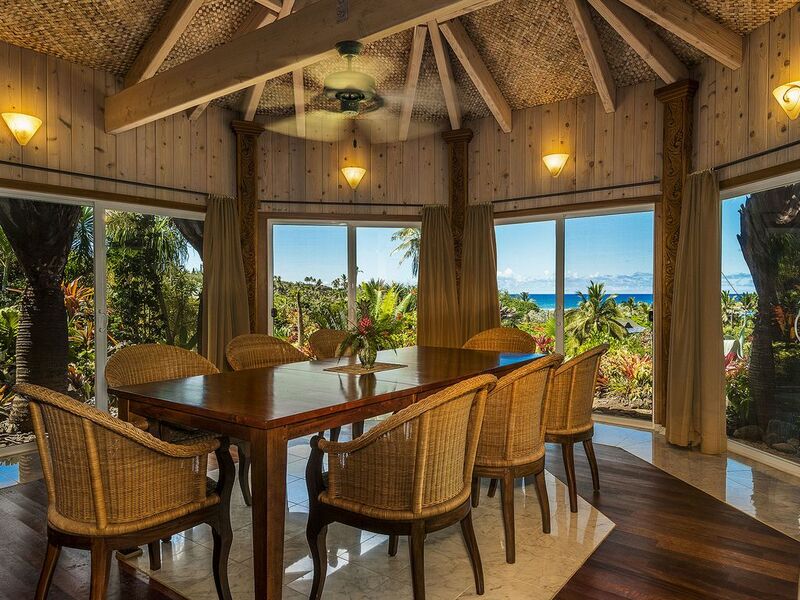 Not to mention a dining area where you will be mesmerized by the sound of the surf and the colors of the Pacific. Over 1/2 acre of fragrant gardens, and manicured lawns lead to 260 yards of shoreline. One of Hawaii’s only saltwater pools is built into the lava rock point. One of Kauai’s most stunning properties, Ka Lae Kiki is private enough to allow you to escape from the world, but only minutes away from some of the islands best snorkeling, surfing (a short paddle from the property), golf (including Poipu Bay, home of the annual PGA Grand Slam event), restaurants and shopping, should you want to venture out. Formerly the getaway of George C. Scott, John Wayne and others seeking seclusion, unobstructed sunrises and sunsets, and Polynesian luxury, Ka Lae Kiki offers the vacation of a lifetime. Ka Lae Kiki is a rare find, a place where time is easily forgotten and the calm island rhythms fill and nurture your soul. PRINCEVILLE, KAUAI VACATION RENTAL: Behold the stunning majesty of Kahikolu, a 3 bedroom/ 3 bathroom, Princeville, Kauai tropical vacation home. 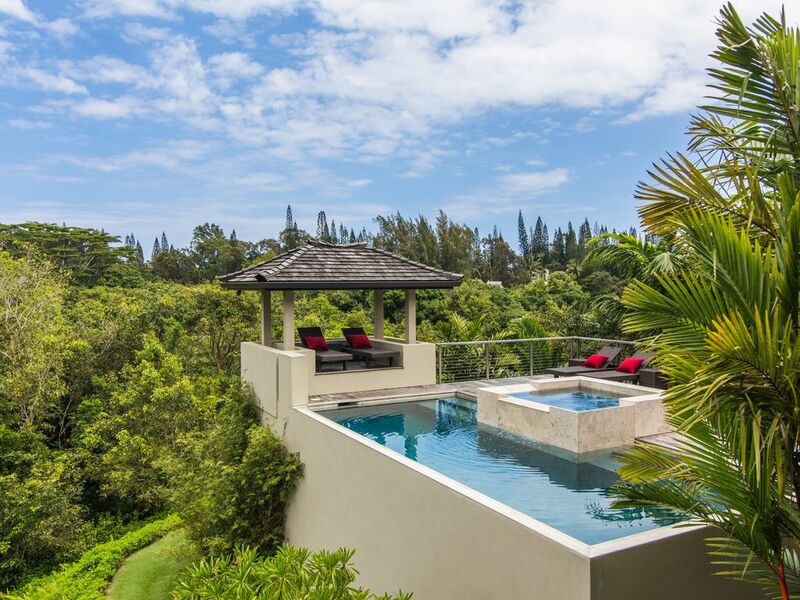 Nestled in the treetops with magnificent views of three separate mountain peaks (Hihimanu, Namolokama, and Mamalahoa) and the vast blue ocean between Hanalei Bay and Ha’ena. A meandering tropical garden path takes you past fruit trees and an herb garden on your way to the professionally landscaped yard. The home is furnished in muted, neutral tones, allowing the verdant greens and aquamarine blues of nature to take center stage. Floor to ceiling windows abound in every room, allowing you to revel in the stunning scenery before you. A large covered lanai, complete with travertine tile, a seating group and ceilings fans provides you a serenely perfect spot from which to enjoy the sights and sounds of nature as you sip your morning coffee. For lunch or dinner, have a good old fashioned family barbecue, using the provided gas grill. The infinity-edge saltwater plunge pool will also provide hours of fun for the whole family. A fully functional and masterfully equipped kitchen awaits the family or group chef. Large working spaces featuring granite slab overlook lush views. Elite appliances including Wolf, Subzero, Thermador and Bosch will surely inspire delectable meals, served in style at the dining table for 8. With 3 bedrooms and 3 full baths, this 3200+ square foot home comfortably accommodates your party of 8. The second floor master sanctuary offers A/C, a king size bed and separate generous sitting area . The master bath boasts a Jacuzzi tub with glass walls overlooking almost impossibly beautiful vistas. A second master suite offers a King bed plus a full size sofa sleeper and sliding glass doors to a balcony overlooking the mountains and sea and a full bath with a step-in shower. The third bedroom boasts a queen bed with garden views and private lanai. Additional amenities provided for the outdoor enthusiasts at Kahikolu include 2 bicycles, 2 surf boards and 2 boogie boards. The yogis in the group will appreciate the two yoga mats. The whole group can have some fun together with the ping pong table and horse shoe pit. In the surrounding area, you’ll find an assortment of delicious restaurants, from food trucks to elegant dining. Enjoy Kauai from a new perspective on a helicopter tour above the Na Pali coast. Make sure to visit Hanalei, with its eclectic shops and the world-famous Hanalei Bay and most importantly, don’t forget a shave ice, the Hawaiian dessert speciality. An unforgettable vacation is waiting for you in Princeville, Kauai. Come visit us soon. 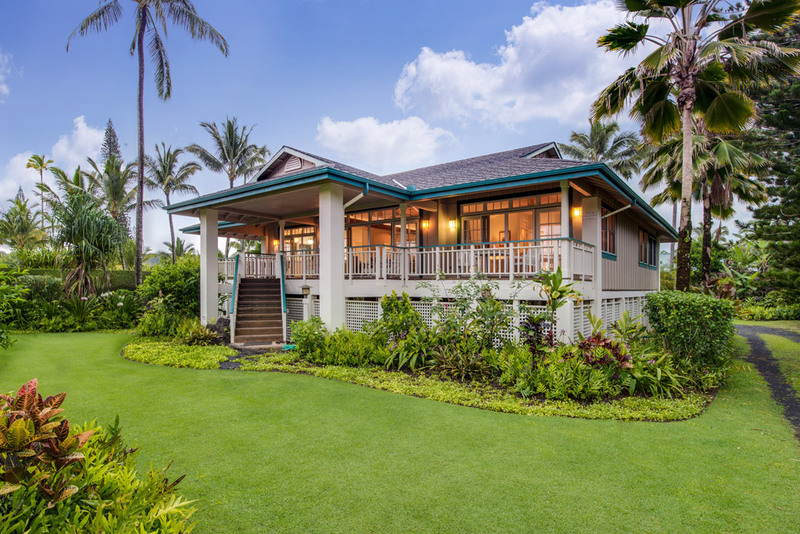 PILA’A, KAUAI VACATION RENTAL: Kai Halulu is a private and elegant 3BR/3BA house is a masterfully crafted one-of-a-kind home that boasts exquisite custom design and detail throughout both the exterior and the interior. Perched cliffside on 10 acres above Pila’a Beach on Kauai’s North Shore, this property offers numerous spots to take in the sprawling views of the crystal blue Pacific to the east and verdant mountains to the west. As well, a private walking path from the property leads to a remote and idyllic beach below. While all three bedrooms have king size beds and ocean views, the rest of the interior was planned with luxurious precision, with rich hardwood floors, abundant deck space, a grand entertainment room with home theater and state of the art sound system and unique features such as a dining gazebo, and Jacuzzi. One of the master suites is a separate unit with king bed, 1/2 bath and outdoor private hold/cold shower, not connected to the main house but accessed via a walkway several steps away. Other Highlights Of Kai Halulu Include: Fireplace, BBQ, Central Lined Tiki Torches, DSL High-Speed Internet, Full Kitchen, Washer/Dryer, Large Flat screen TV, Built In Wet Bar. ALIOMANU, KAUAI VACATION RENTAL: Kauai Gardens at Aliomanu Shores is a three bedroom, five bathroom Vacation Rental with a one bedroom, one bath Guest Cottage set on 1.3 hilltop acres above Aliomanu Beach. This home exhibits a multitude of custom features and exotic materials laid out in stylish architectural detail. The open airy floor plan, all on one level, showcases a chef’s kitchen, expansive living and dining areas and three spacious ocean view bedroom suites, each with private lanais. The Guesthouse is also designed with the tropics in mind incorporating well thought out details and island accents with a large ocean view deck. 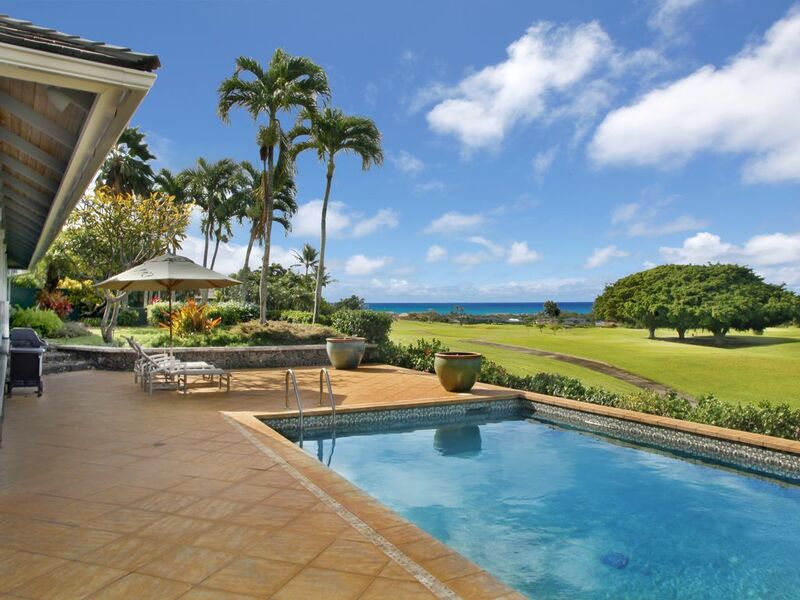 KILAUEA, KAUAI VACATION RENTAL: The Kauai Pavillions is the ultimate luxury 4 bedroom/ 3.5 bath estate, located above the prestigious Secret Beach on the Garden Island’s North Shore. 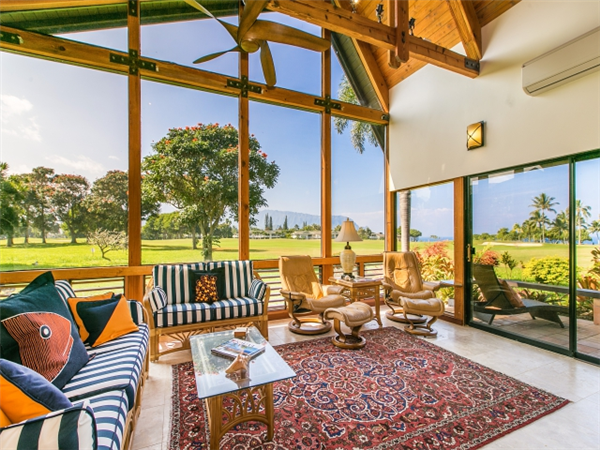 HANALEI, KAUAI VACATION RENTAL: Mature gardens, expansive lawns, grazing pasture, and an ancient Hawaiian fishpond are just a taste of the treasures which await discovery at Kauikeolani in Hanalei, Kauai. Kick off your shoes and stroll upon a thick green carpet, where sculpted shade trees beckon you to lie down – “if only for a brief while.” Dive into the cool ocean beneath the hallow glow of moonlight; or enjoy an afternoon on the 9 hole practice course, which unobtrusively wanders its way throughout the Hanalei estate. The Estate is comprised of six separate accommodations. Kauikeolani, once the residence of Albert and Emma Wilcox, remains as the central structure upon the land. The original home dates back to 1800s, at which time it was a comparably modest structure of only three bedrooms. However, as the Wilcox generations grew, so did the walls of Kauikeolani. Today, the main house is comprised of six bedrooms and six bathes, comfortably accommodating a total of twelve guests. 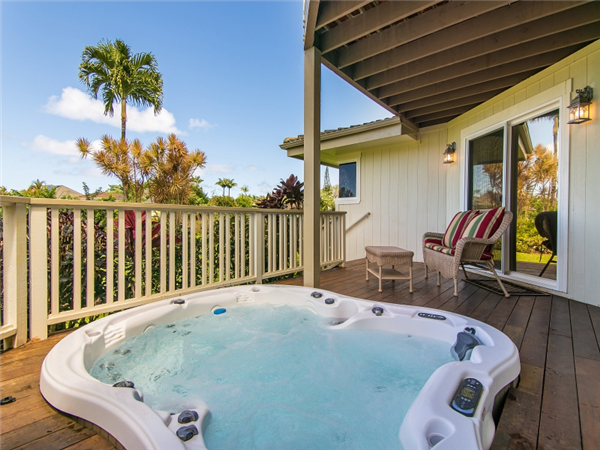 KALIHIWAI, KAUAI VACATION RENTAL: Imagine waking up to a bright sunny day, stepping out of your master suite onto the lanai and enjoying the breathtaking view of Mount Namahana for the first time. Walk down through the citrus grove and pick unlimited oranges, tangerines, grapefruit or tangelos and make fresh squeezed juices to start your day. Step beyond the trees onto 500 acres of trails for you to explore at your leisure. Walk, jog or bike to a magnificent waterfall in a park like setting. Then cool off in the Ke Aloha pool or perhaps a workout in your very own fitness center. As you walk back to the house, grab an avocado or coconut to snack on later. All this, without ever stepping into a car. Just a typical day at Ke Aloha Estate. The Ke Aloha Estate is a totally private, 5-Acre tropical paradise which offers an ideal retreat for multiple couples and family gatherings. Suitable for a quiet getaway, reunion, or simple vacation for friends and family. 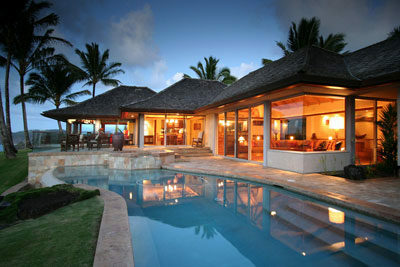 The Ke Aloha provides an extensive list of amenities, unlike any other luxury rental on Kauai. This home is the only north shore rental that has a commercial private gym on Kauai. It includes 2 treadmills, stationary bike, 2 elliptical steppers and a variety of weight training multi station machines. The house has bicycles, stand up paddleboards, surfboards, boogey boards, snorkel gear and every other beach accessory that is appropriate for Kauai. 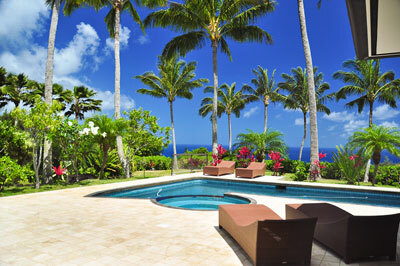 No other Kauai vacation rental has such an abundance of amenities for you to enjoy. Brand new electronics include LCD Flat Screen TVs throughout, video game system and an iMac computer filled with approximately 10,000 songs. The iMac guest computer system will offer an unparalleled collection of Hawaiian and island music to enhance your tropical experience. Brand new upscale patio furniture including chaise lounges for the pool are included, in addition to a stainless steel gas barbeque. The Estate has a swimming pool which incorporates a child friendly shallow wading area and a new Hot Tub. There is also a children’s playground, as well as a koi pond and acres of fruit trees. Guests can gather Lychee, dragonfruit, bananas, mangos, papaya, avocados and starfruit. There is also a citrus grove featuring orange, tangerine and grapefruit trees just waiting to provide fresh squeezed beverages to start your day. This property offers total seclusion as it is enclosed by hundreds of ironwood and palm trees. Just pull out of your driveway and you are moments away from Kalihiwai Bay, Anini Beach, Secret Beach, Hanalei Bay, and The Princeville Resort Community. 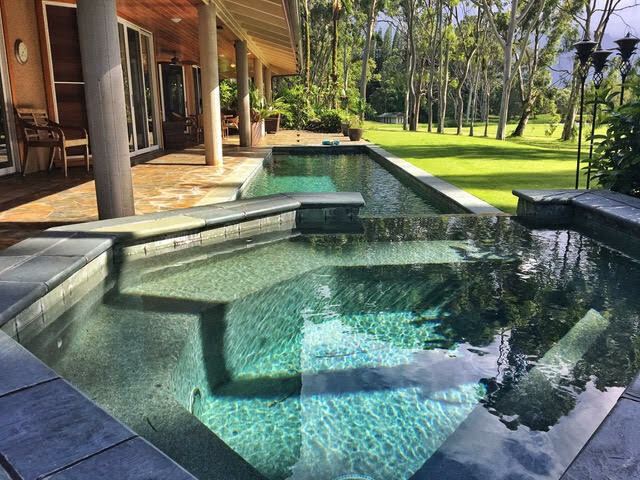 The home is in the exclusive Kalihiwai Ridge Sub Division just by the Princeville border, placing it central to the towns of Hanalei, Princeville and Kilauea. There you will find the island’s best nightlife, restaurants and gift shops. 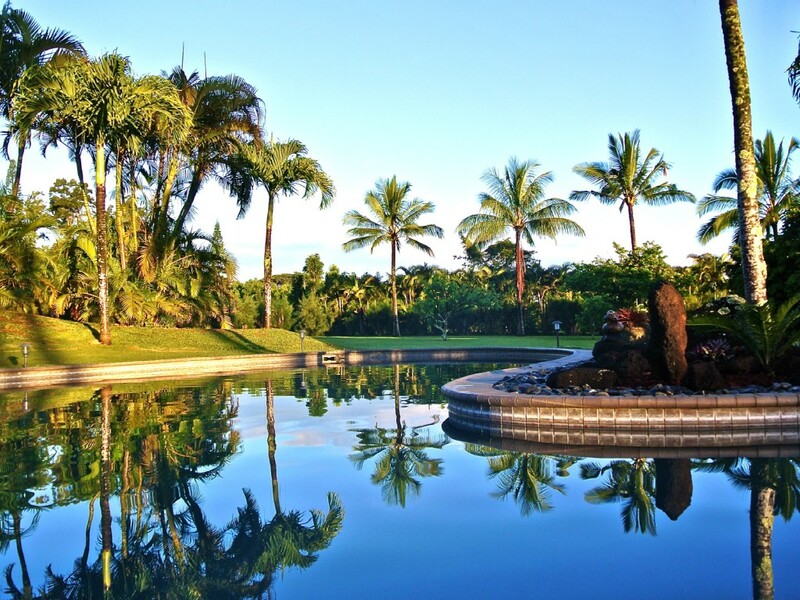 So if you want a vacation home with your very own backyard paradise, look no further than ‘The Ke Aloha Estate’. PRINCEVILLE, KAUAI VACATION RENTALS: Mahina is an immaculate 3 bedroom/3.5 bath home tucked away on the Makai Golf Course in Princeville. This beautiful home features 2 master suites upstairs, as well as a guest master downstairs. 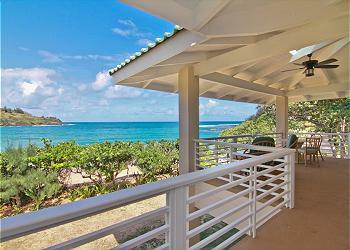 Expansive upstairs and downstairs private lanais open up to relaxing views and Kauai’s quiet serenity. 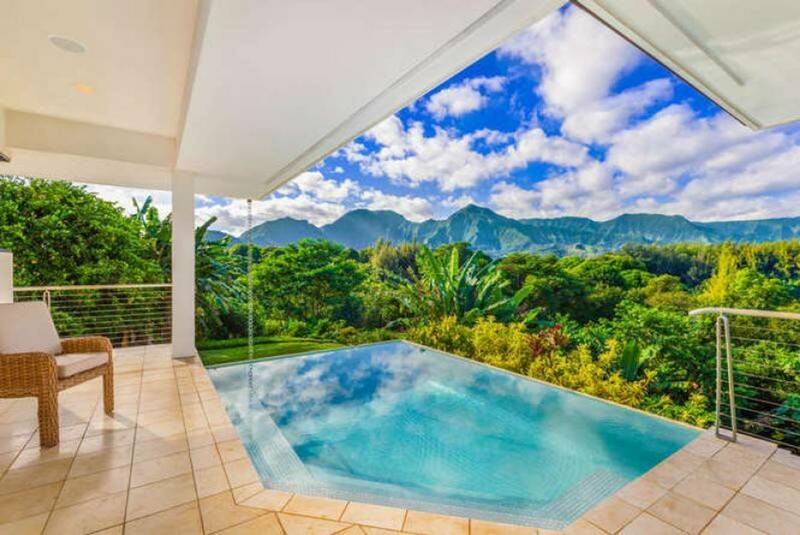 With a pool and jacuzzi, this Princeville gem hits all the marks of a much more expensive home. It’s located just minutes from the shops at Princeville Shopping center, as well as walking trails to Anini Beach, Hideaways Beach, and Hanalei Bay. 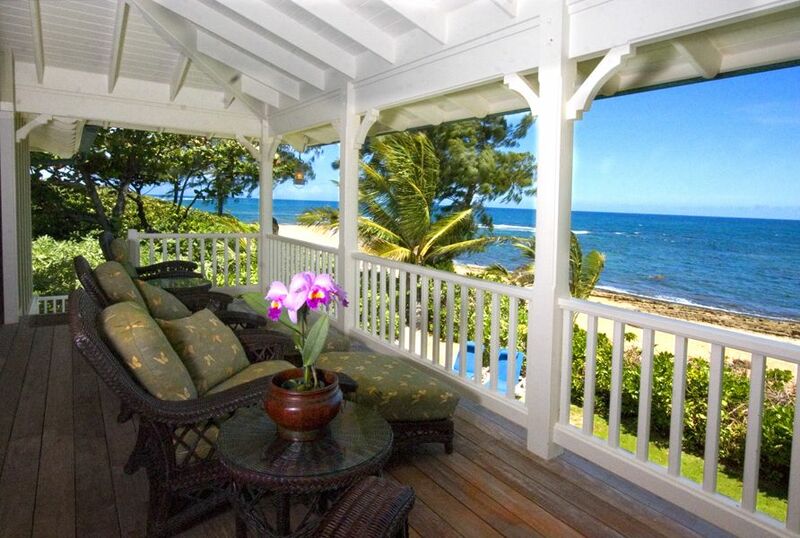 POIPU, KAUAI VACATION RENTAL: Enjoy the serenity and privacy of the Milo Hae Hale. 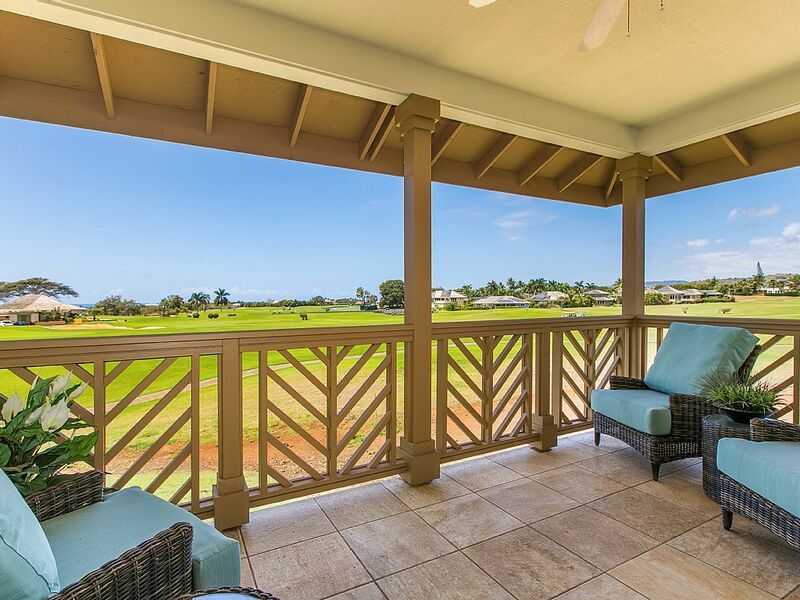 This beautiful 3 bed 3 bath home features privacy and comfort nestled within the exclusive Kiahuna Golf Village community on Kauai’s scenic and sunny South Shore. Enjoy the 1990 square foot spacious open floor plan with vaulted ceilings and beautifully decorated great room. From the great room, the glass door opens to a covered lanai where compelling golf course, mountain and distant ocean views prevail. The Gas BBQ and comfortable sitting area make for perfect outdoor dining on the private fairway facing lanai. Enjoy all the Robert Trent Jones, Jr. community has to offer conveniently located along the Kiahuna Golf Course. Shopping, golf, and beach amenities boast around this beautiful island oasis. This home offers its guests a beautifully designed and appointed living spaces that complement Hawaii’s indoor/outdoor living. The large master bedroom boasts stunning golf course views as well as romantic furnishings that include a king size four poster bed. The home also includes access to a completely private outdoor lava rock shower. This shower may be entered from outside the house for conveniently rinsing off the sand after a day at the beach. This home is perfect for a family or a few couples to enjoy Kauai in pure comfort. The Milo Hae Hale is conveniently located only minutes away from the Poipu Beach Park, the Grand Hyatt Resort, and within 2 miles of the shops at Kukui’ula. This location provides easy access to dining, shopping, exploring art galleries and enjoying the popular gourmet farmers market. The south shore is centrally located between the lush north shore and the spectacular west side with the Waimea Canyon and Na Pali coast overlook. The Milo Hae Hale is less than 30 minutes from the Lihue airport, Costco, and many local grocery stores. It is a spectacularly appointed luxury home that is truly convenient to everything! 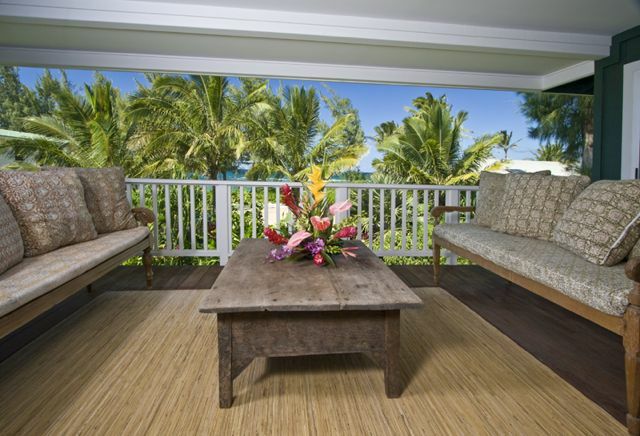 MOLOA’A BAY, KAUAI VACATION RENTAL: The Moloa’a Bay Hale sits on 2.5 acres of pristine white sand beach frontage. Moloa’a Bay was the site location for the TV pilot of “Gilligan’s Island”. Here is where the USS MINNOW and its crew originally shipwrecked. This may be as close as you will come to living on Gilligan’s Island. This is everything you ever dreamed Kauai to be! A perfect crescent sand beach and torqouise waters. The location is at mystical Moloa’a Bay located on the North East side of Kauai. Truly “Off-The-Beaten-Path” giving one the sense of an exclusive & genuine experience of the REAL Hawaii. 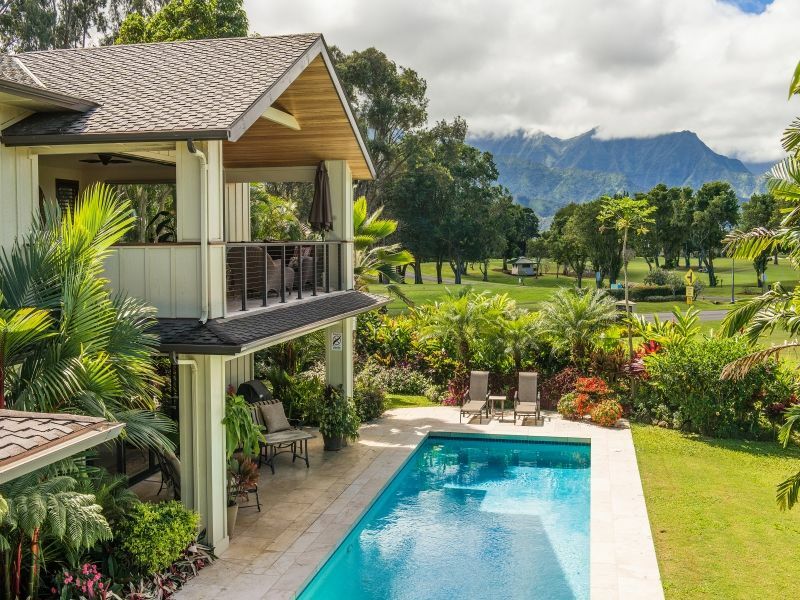 PRINCEVILLE, KAUAI VACATION RENTAL: Located on the majestic north shore of Kauai and just minutes away from some of the most beautiful white sand beaches in the world, the 7B/4B Mauna Pua offers the luxury of a five star resort with the comforts and privacy of home. Style and elegance take center stage with panoramic views overlooking the lush green valley and azure blue Pacific. This stunning, three-level home is designed to accommodate families or large groups with an option to rent four to seven bedrooms. The grand master suite is located in the main house nestled among the trees with an expansive, romantic lanai, en-suite bath, sitting area, TV and lovely ocean views. The lower level boasts a spacious living room with a media center. Large glass doors open up to a welcoming lanai for friends and family to gather for festive barbecues, or relaxing with a tropical cocktail. The kitchen is a culinary artists’ delight with well appointed Kitchen Aid stainless steel appliances including a 6 burner gas stove, brand new refrigerator, large island and seated counter area. Serve up delicious island-inspired meals in the eight person dining area, with additional seating at the counter bar stools, if needed. Three guest rooms and bathroom are located just down the hall—two with queen beds and one bunk room with a double and twin bed. If more space is needed, the lower level offers a two bedroom, one bath suite with Queen bed and bunk bed (double +twin), living area, TV (smart TV, no cable) and access to the outdoor gazebo with chaise lounge chairs for reading and relaxing. There’s even a separate garden suite with a private entrance, full size bath, kitchenette, TV, A/C, and full size bed. 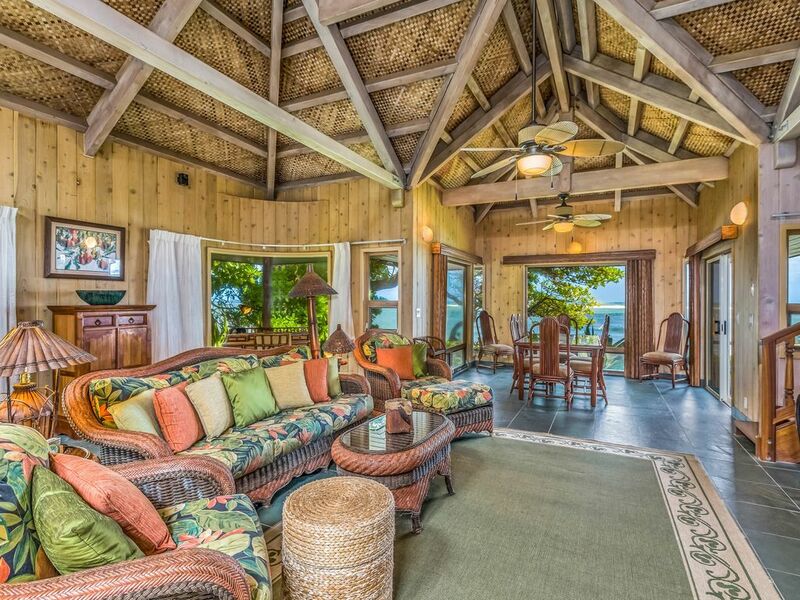 KAPAA, KAUAI VACATION RENTAL: Niulani Lanikai is graced with breathtaking views of the Pacific Ocean, this This Hawaiian style nearly oceanfront custom built home affords the flexibility to entertain up to 8 guests in three distinct on-site properties. Located in ever-popular Kapa’a, you’ll find yourself just steps away from the Kauai Village Shopping Center, pristine beaches, cool and funky boutiques, the incredible restaurants of Kapa’a and many of Kauai’s most popular attractions. At this central location, you’re a 5-minute car ride from Lydgate State Beach Park, Fern Grotto, Kamalani Playground and Wailua Golf Course. For those who enjoy an active experience, rent a kayak and paddle up the Wailua River to see not just the breathtaking scenery, but one of the hidden waterfalls that Kaua’i is famous for! If you’d like to stick closer to home, simply walk outside your door and take a stroll on the walk/bike path, as you listen to the waves crash and marvel at the clear aquamarine water. The main home of this unique property boasts two bedrooms, a loft and 2 full baths. In traditional Balinese style, you’ll find lofted post-and-beam style ceilings, creating plenty of air flow throughout the great room. This area is richly decorated in island decor and offers living room seating for 5, oceanfront dining for 6-8 and a spacious and fully equipped kitchen. 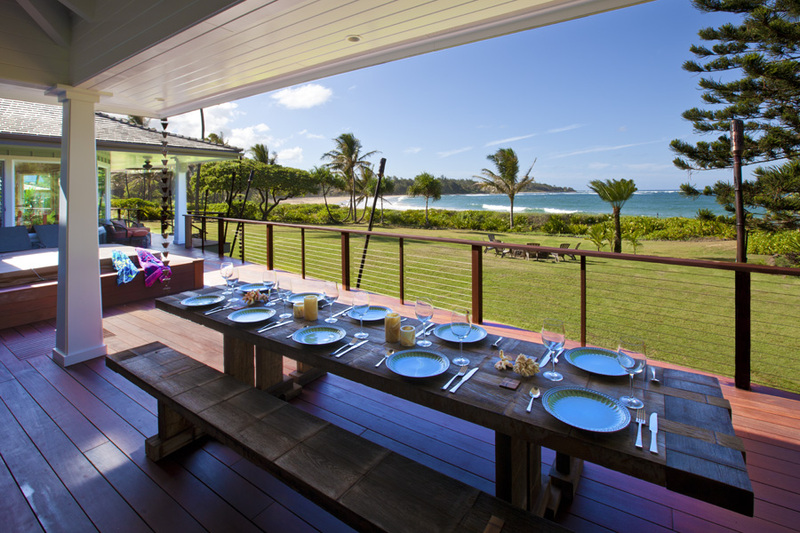 Walk out on the deck to enjoy a meal al fresco at the teak dining table, prepared with a custom BBQ grill or soak up the sun in one of the sun loungers. The master bedroom is equipped with a king size bed on the oceanfront side with sliding glass doors that leads out to the ocean side lanai and private marble lined bath/shower. The 2nd bedroom has a queen size bed. A loft bedroom over the living area offers a full size bed. The Beach Bungalow above the garage is a 1 bedroom with Queen bed, 1 bath property with vaulted ceilings in the comfortably furnished living area, full bath with a beautiful marble lined shower, TV & DVD player. The Beach Cottage is a detached one bedroom with Queen bed, one marble-lined luxurious bath home with a cozy living area with flat screen TV/DVD, partial kitchen with refrigerator and breakfast bar for two. It also boasts a front porch and small lanai off the main bedroom. This property is perfect for any size party, from a romantic getaway for two to a family vacation. POIPU, KAUAI VACATON RENTAL: Pili Aloha is the perfect getaway for your whole ohana! Just a five-minute drive from some of Poipu’s finest beaches, our home is also just a five to ten-minute walk from the Poipu Beach Athletic Club. The yard features a barbecue and courtyard lanai overlooking the Kiahuna Golf Course. An outdoor shower is perfect for a rinse after the beach. When you’re ready to come inside, the spacious living room has a flat screen tv—perfect for movie nights. The living room opens into the kitchen and dining area, which seats 8. Tastefully decorated in a tropical style, our home brings the breezy vibes of Poipu into every room. A total of 8 guests can sleep in the home. The master bedroom—with a king bed and attached bathroom—and first guest bedroom with a queen bed on one side of the home. The other bedroom and den are on the other side of the house have a queen sofa sleeper and two twin beds and share the house’s third bathroom. 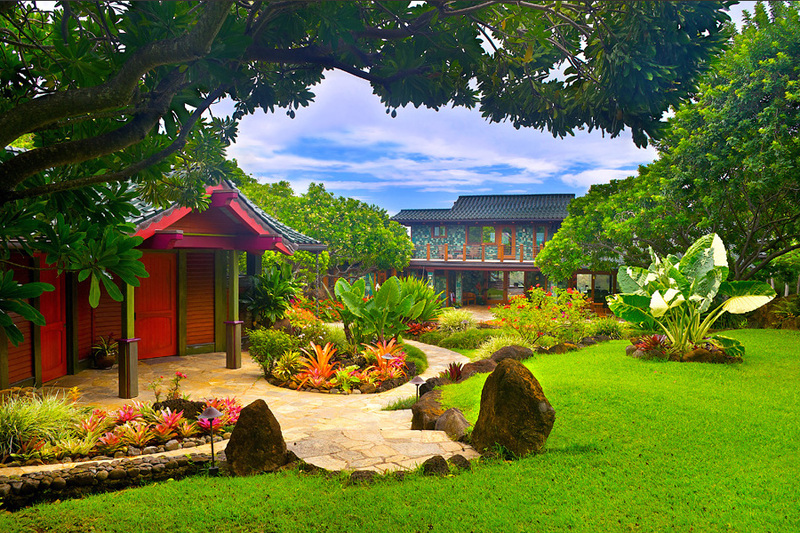 When you leave this beautiful home, you’ll be yelling hana hou (one more time) for sure! Beautifully Decorated: This Pili Aloha home was the model for the subdivision and it shows. Your Place in the Sun: Our dreamy backyard with barbecue and lanai is the perfect spot to recharge at your own pace while enjoying a breeze and making memories with your ohana. A Walker’s Dream: After a lazy day on the beach, cruise around this quiet neighborhood with it’s beautiful views of the mountains. Whether it’s teeing off on an 18-hole golf course, hiking or zip lining through Kauai’s lush landscape or getting up close and personal with sea creatures during an afternoon of scuba diving, you’ll have no problem finding an experience that’s worth writing home about. And when you’ve worked up an appetite, walk 15 minutes to Keoki’s Paradise and the Poipu Shopping Center. If you’re looking for a resort-style stay, we have you covered. For an additional fee you’ll have uninhibited access to the Poipu Beach Athletic Club, home to a fitness center, hot tub and sparkling pool with a waterslide and sand-bottomed kiddie section – everything you need to work out, cool off or wind down. Spaces are limited. POIPU, KAUAI VACATION RENTAL: Wikiwiki (hurry), make your reservation today if you want brand new, beautiful and central a/c, this is your home away from home! Pili Mai 10-K is a one story condo on the 2nd floor, newly built in 2015 this is a gorgeous 3 bedroom/ 3 bath on the Kiahuna golf course that sleeps 8. Brand new condos being built through 2017. Surrounded by the beautiful Kiahuna Golf Course, mountain and distant ocean views. 191 luxury townhomes and condos, with central air conditioning and living spaces ranging from 1,208 to 1,850 square feet. Pili Mai is a short walk to the Poipu Beach Athletic Club. Five minute walk to the Poipu Shopping Center where there are many wonderful restaurants and shops. Poipu Beach is a three minute drive with plenty of free parking. If you like luxury, want to stay cool in the a/c and live the good life, this is the perfect place for a memorable vacation. Start up kit of paper and cleaning products such as paper towels, toilet paper, laundry detergent, etc. Pili Mai 10K is a one story condo on the 2nd floor. 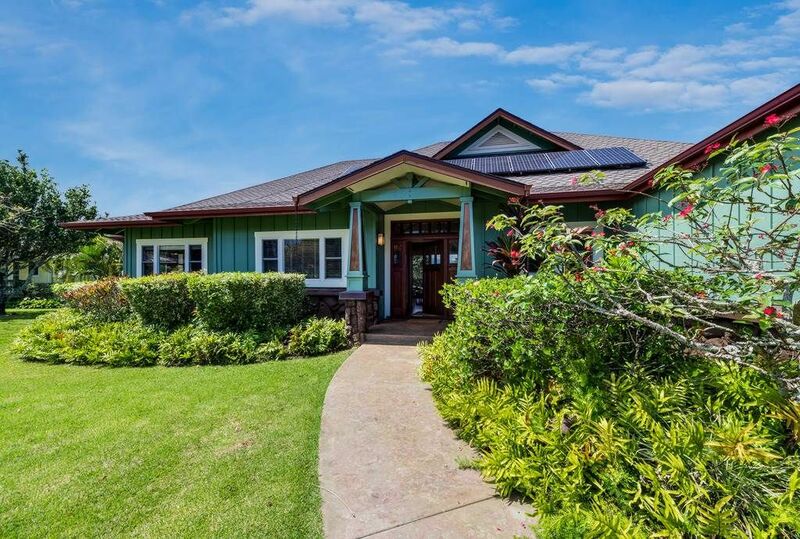 POIPU, KAUAI VACATION RENTAL: Don’t just vacation in Hawaii, live in total luxury at Poipu Shores 101C (2B/2.5B) with central air conditioning and porcelain wood plank tile throughout! This beautiful townhome is located on the end with water views on two sides. There are turtles floating below every day. Experience million-dollar views from the extra large lanai downstairs and the master bedroom lanai upstairs, where you can enjoy fabulous sunsets and watching dolphins and sea turtles play. The mind-blowing views continue inside as well in the living room, kitchen and dining room, where the Pacific Ocean sparkles through the floor-to-ceiling windows. Enjoy the huge Flat Screen TV with DVD and CD stereo from the comfortable couch which is also a queen-size sofa sleeper. Flex your cooking muscles in the renovated kitchen, where you’ll find wentwood green Cambria quartz counters, custom afromasia wood cabinets and high-end stainless steel appliances. Dine al fresco at the 4-person table on the lanai or eat inside at the 4-person dining table. In the master bedroom, the crisp white linens on the king bed contrast beautifully with the blues and greens of the ocean right out the huge picture window. The master en-suite bath comes with a quartz vanity and large, luxurious walk-in shower. Guest Bedroom has two twin beds with a full bath and tub. This high-end condo has finishes and fixtures with designer touches that even the most discriminating guest won’t be disappointed! Top-shelf amenities include a washer and dryer in the condo, BBQ area for all guests to use and starter kits of Kauai Coffee Company and Island Soap and CandleWorks toiletries. 1. End Townhome: From your perch on the cliff, you’ll get a bird’s eye view of the stunning surroundings and colorful sunsets. Watch sea turtles and dolphins play all year-round and whales swim through the area in the winter months. 2. Beautiful Pool Area: Set right on the edge of the ocean, the sparkling heated pool is an oasis for all ages. Lay on the pool deck worshipping the sun or visit the pool and jump right in and splash around to cool off from the afternoon heat. 3. Flexible Floor Plan: With 2-bedrooms, one with a king bed and one with two twins upstairs, the flexible floor plan is one of the largest at Poipu Shores. It’s ideal for a family with kids or two couples traveling together. If you need even more space, the living room sofa doubles as a queen sleeper sofa. Grab the towels, umbrellas and beach chairs and take a short 5-minute walk to Brennecke’s Beach, a hot spot for turtle watching and bodyboarding. A large grassy area with picnic tables and covered pavilions connects Brennecke’s to popular Poipu Beach. Along with snorkeling, paddle boarding, swimming and surfing, Poipu Beach also has a small baby beach protected from the waves that’s perfect for kids. ANINI BEACH, KAUAI VACATION RENTAL: With 180 degree panoramic ocean views, this 4 bedroom, 4.5 bath, spectacular Anini property is almost indescribable. 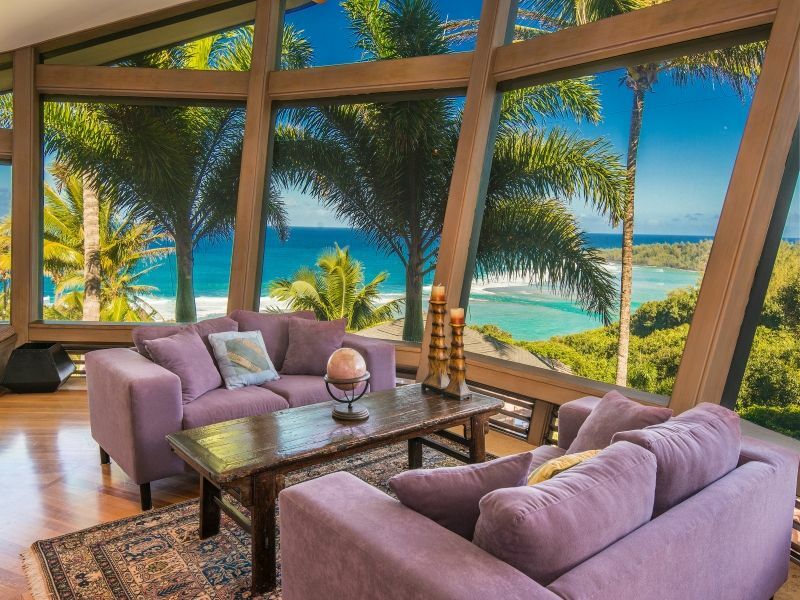 Built in 2001, its entire custom design makes the most of the north shores’ natural beauty taking in the morning sunrise and views of the Kilauea Lighthouse and Kalihiwai Point. Lush landscaping surrounds the home serenely located at the end of a private cul-de-sac in the prestigious gated community of Anini Vista. The master bedroom, kitchen, living and dining areas are located in one building and the guest bedrooms and office in another so that each bedroom has its own bathroom, stunning ocean views and private lanai. Tasteful furnishings complement the custom wood floors, cabinets and marble counter tops. Separating the two wings is a covered lanai and outside entertainment area that looks out over the infinity edge pool to the ocean beyond. Waterfalls flow from two ponds at the entry and into the pool from an octagonal spa creating a sense of tranquility. A high-tech integrated sound system can be played throughout the property and programmed lighting settings create the perfect mood.The spacious open plan living area boasts a theater style retractable screen and projector while the well equipped kitchen and dining area accommodate the most discriminating guests. The master suite comes complete with steam shower, Jacuzzi bath tub and outdoor shower. A pop-up plasma TV at the foot of the bed ensures breathtaking views in every direction.